Wearing a helmet in a wide variety of outdoor sports is an obvious choice for many people. 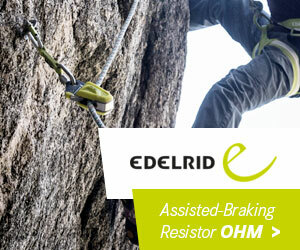 For Petzl, offering more than simple protection for your head is one of our primary concerns! Whether mountaineering, rock climbing, backcountry skiing, traveling over a glacier, canyoning, or caving, for those of you who enjoy adventures in the vertical world a helmet is essential. TOP AND SIDE PROTECTION adds to your safety. Currently, all climbing and mountaineering helmets provide a certain level of protection that helps protect the top of the head from falling objects. This level of protection is guaranteed by the requirements of the EN 12492 and UIAA 106 standards. However, impacts to the front, rear, and sides of the head occur just as frequently as impacts to the top of the head. For this reason, Petzl is manufacturing helmets that guarantee a certain level of protection throughout the entire helmet and not just the top. These helmets carry Petzl’s proprietary label--TOP AND SIDE PROTECTION--for easy identification. What are the requirements for a helmet to have theTOP AND SIDE PROTECTION label? When a helmet has theTOP AND SIDE PROTECTION label, it means that it meets both the testing requirements of the EN 12492 and UIAA 106 standards as well as Petzl’s in-house testing protocol. The EN 12492 and UIAA 106 tests focus on the top portion of the helmet while Petzl’s in-house testing protocol extends to all areas of the helmet. The TOP AND SIDE PROTECTION label represents Petzl's new in-house standard that guarantees its helmets provide front, side, and rear protection. Today, all climbing and mountaineering helmets provide top protection for the wearer from rock fall. Direct feedback from the field indicates that side, front, and rear impacts are regular occurrences. Petzl certifies and commits to providing a certain level of protection for these types of impacts with its TOP AND SIDE PROTECTION label. Petzl's SIROCCO, BOREO, kids PICCHU and new METEOR all meet the requirements of TOP AND SIDE PROTECTION. To discover more about Petzl helmets, visit us.